This day had to be started without oatmeal porridge, an ordeal, but we survived. Instead, we had tea and baguette with some cheese and marmelade. 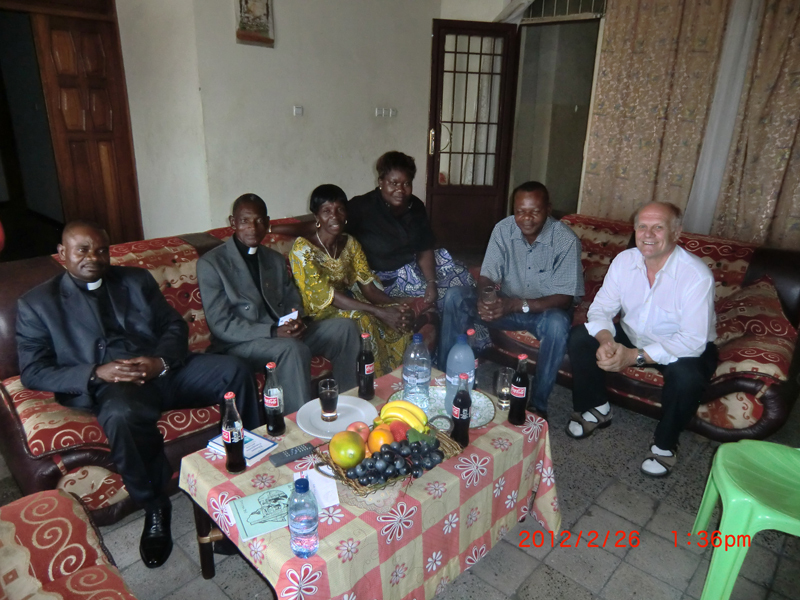 In Kinshasa, Tuto´s sister Emma is in charge of the cooking. I suspect oatmeal porridge is an unknown phenomenon to her. After breakfast, we went to the Bandalungua Church. Marie France is a pastor in this church. 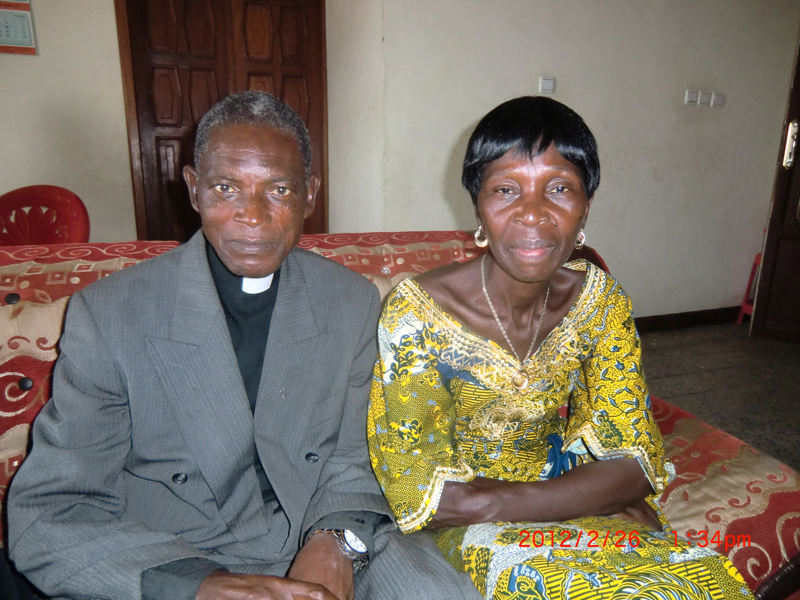 Before, she was a pastor in the Kiamvu Church in Matadi, where she participated in our first group of entrepreneurs. For her, the entrepreneurial activities are a job on the side. We had several part-time entrepreneurs in the first group, but we prefer it when the enterprises are the full-time job of the entrepreneurs. By 10 o´clock we arrived at the church and met Marie outside. Because of this, we seated among the dignitaries. We also got an special item on the program, when we were particularly welcomed, and Yapeco introduced us and MSG. 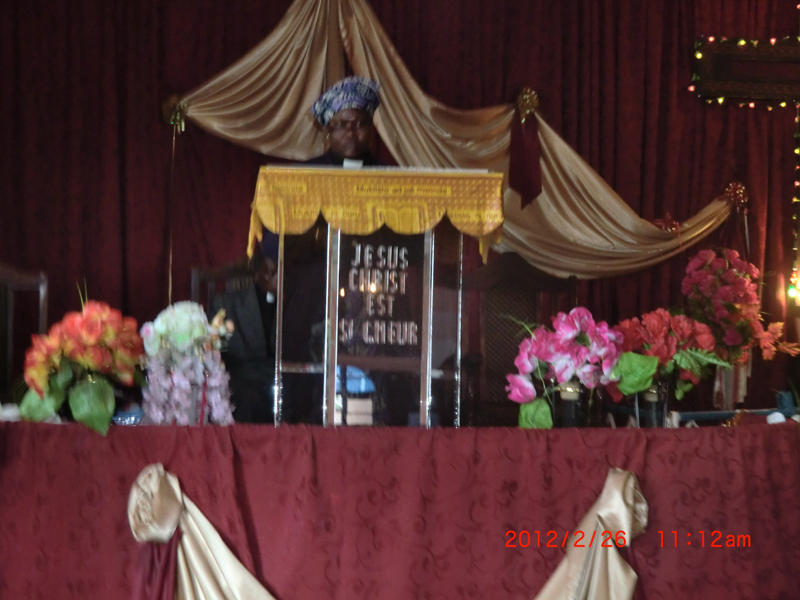 The service was a traditional Congolese service. Four choirs sang and a group of flutists played. Wola Benard, a retired pastor and the preacher of the day spoke with an intense ardour. To fall asleep while he was preaching would have been impossible. 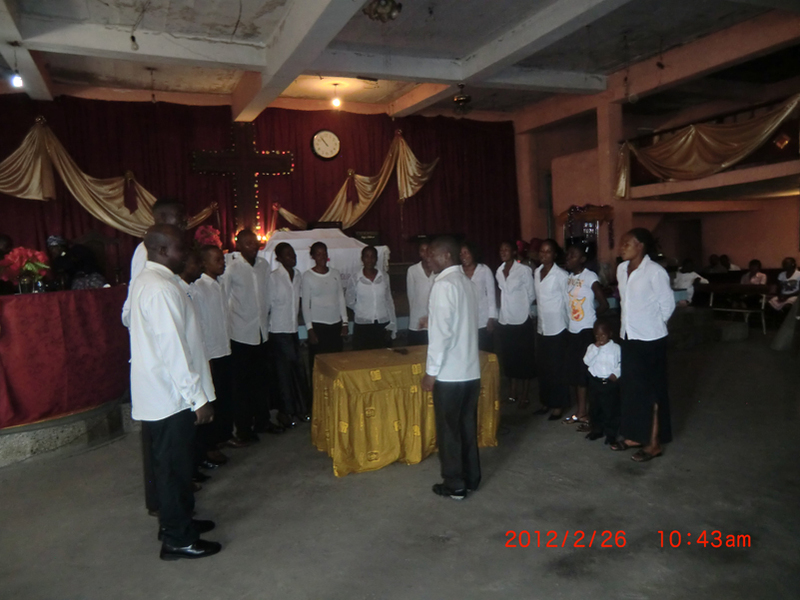 He incorporated community singing in his presentation, and like many other pastors in Congo, he had a dialogue with the congregation through the sermon. The pastor asks a question, and the congregation answers and confirms the message of the sermon. Many people answer with their whole body. 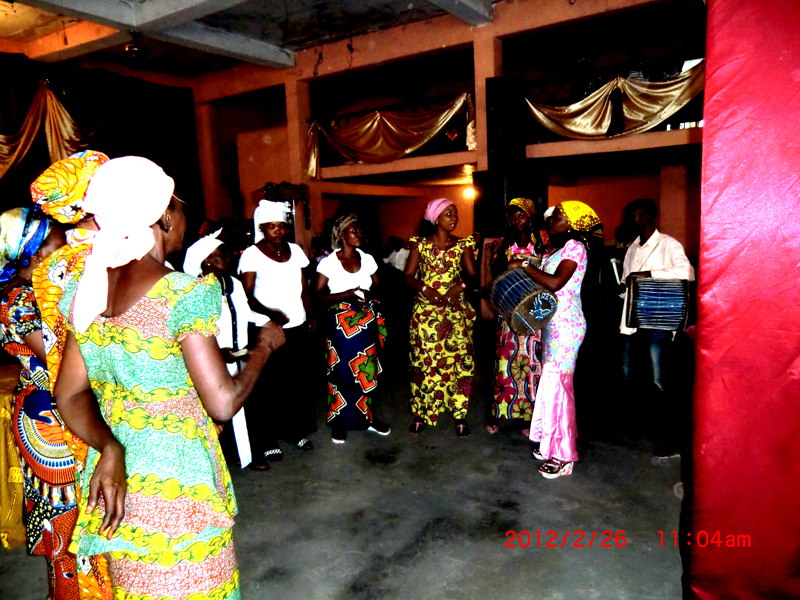 In a Congolese service you can´t be a passive bystander, you will want to take an active part in the spirit of community. The instruments that accompany the community singing are drums and other rythmic instruments. Many people bring their instruments to church. Today, there was also communion. Six white-robed members of the church handed out the bread and the wine to the congregation, who walked up to them singing. By 1.30 pm, the service ended. 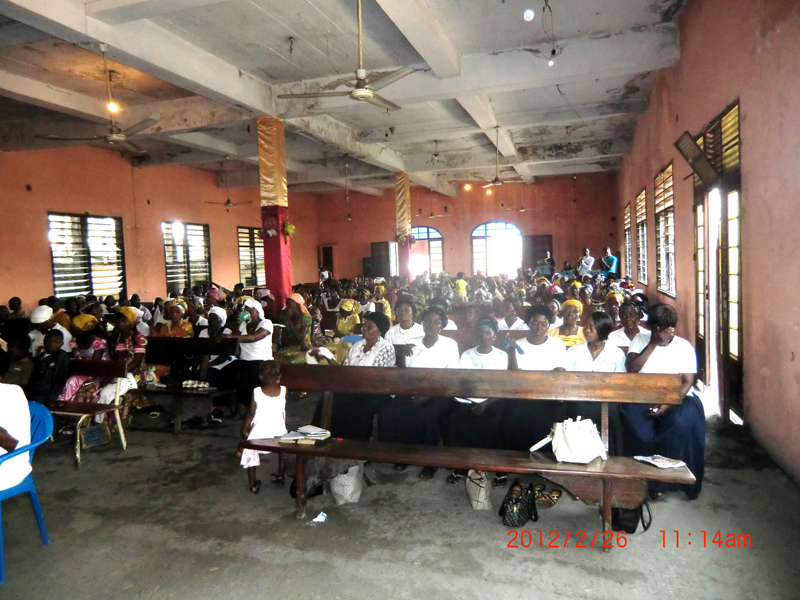 After the service, we were offered soft drinks and lunch together with the preacher and another pastor. Lunch consisted of manioc, salted and smoked fish and safou. We had a nice time with English as a common language. Pastor Wola Benard told us that he had earlier worked with Walter Persson in Sundi Lutete. We had been asked to bring some fabrics from Congo to Sweden, and therefore we took the car to Marie France´s fabric shop. We bought fabrics for as much as 60 USD. We hope that the purchased goods will be approved by our clients in Sweden, because we didn´t discuss any right of exchange with Marie France. 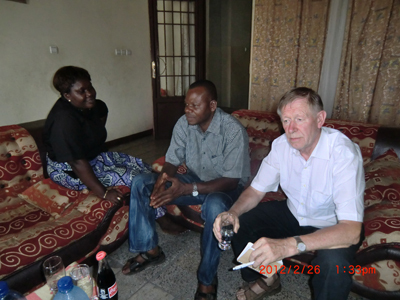 We went back to Tuto´s house and continued the discussion with him about how to arrange the import of solar cell equipment to Congo. And then Emma had dinner ready. We had fish, potatoes and manioc. In the evening, two women who had been to Sweden in March 2011 came. It was Nzuzi Mbumin and Tekabanza Lovise. They belong to the Luozi group that works for the development of a juice factory in Luozi. They had also been to my and Kerstin´s house for dinner. 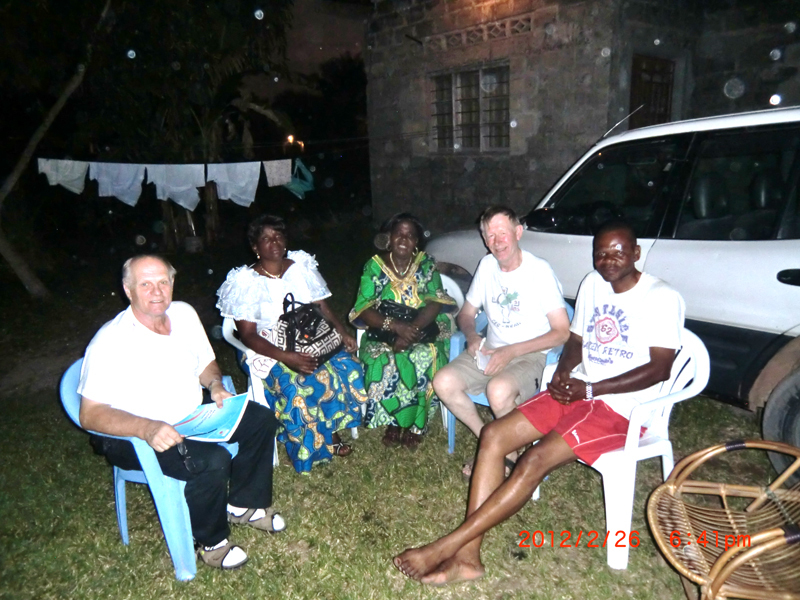 Tonight, they had come a long way by taxi and on foot to meet me and Bernt. We had a nice talk and Yapeco interpreted between us. As a parting gift, we got a basked with pineapple, peanuts, avocado, bananas and safou. Det var inte dåligt att du kom ihåg tyget så mycket som du har att tänka på. Nu har du varit borta så länge så du har väl glömt hur det är när marsnaren viner eller det droppar från taket. Välkommen hem! Hej och tack för en utförlig dagbok. Skönt att allt gått bra och att ni är hemme i Sverige igen. Välkomna hem till Sverige igen.